Special Thanks to: Bethesda Presbyterian Church, City of Rockville, Grace Episcopal Church, Holy Redeemer Catholic Church, Rockville Little Theater, Simplicity Pattern Co. 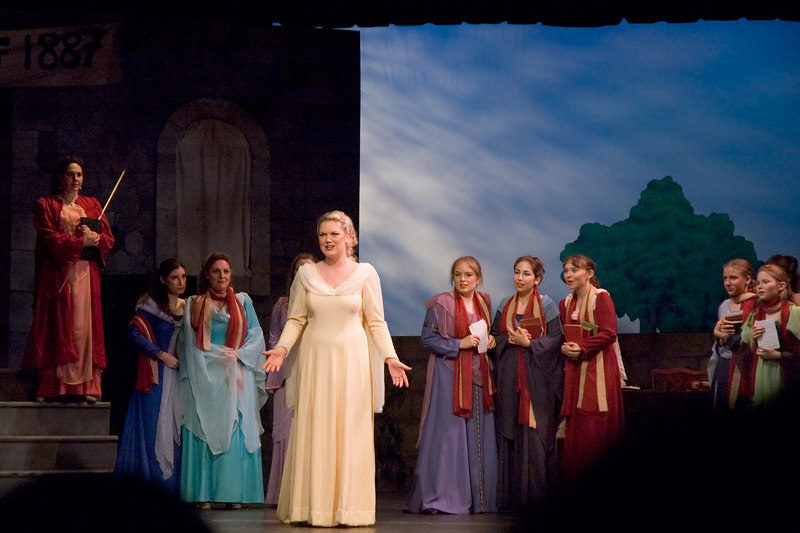 When Princess Ida first graced the stage in 1884, higher education for women was a novel idea in England. Most Victorians believed women did not need a college education, and some even believed university studies could make women ill. The idea was ripe for satire, as was the work of rising star Charles Darwin. Today, we can appreciate Princess Ida not so much as a satire on feminism and Darwinism, but as a commentary of the folly of extremism in any form. aside the childishness of youth to become the man who can be her counterpart and equal. King Hildebrand's household awaits the arrival of King Gama and his daughter, Princess Ida. Prince Hilarion, married to Ida in babyhood, eagerly awaits his bride. Hildebrand, his father, is also eager for this marriage, as the dowry would be welcome help for his sagging finances. Indeed, creditors stand ready to repossess his household treasures! Gama arrives, and announces that Ida has renounced mankind and started a University for women at Castle Adamant. Undaunted, Hilarion journeys to Adamant to win his bride. Hildebrand will hold Gama and sons hostage until Hilarion returns. The ladies of the household, dazzled by the idea of a women’s university, abscond for Adamant. Act II - Castle Adamant University, some days later. Matriculation of new students and Fresher Orientation At Castle Adamant University, new students exchange their confining Victorian wear for new gowns and school scarves. They meet Lady Psyche (Prof.of Humanities), Lady Blanche (Prof of Abstract Science), and finally Princess Ida herself. Hilarion, Cyril and Florian infiltrate the University. They don the ladies’ castoff dresses and disguise themselves as women. Psyche—Florian’s sister—discovers them. Intrigued by the boys, especially Cyril, Psyche agrees to keep their secret. So does Lady Blanche’s daughter Melissa, who is fascinated with Florian. However, when confronted by her mother, a flustered Melissa spills the beans. She convinces Blanche to keep mum—if Hilarion succeeds, Blanche will be left in charge. Their plans are upset when Cyril drunkenly blurts out their secret at lunch. A panicked Ida tries to flee, but slips and falls into a stream. Hilarion rescues her, moments before Hildebrand’s soldiers storm the castle. Hildebrand delivers an ultimatum: marry Hilarion, or he will raze the castle and execute Ida’s brothers. Ida vows to die rather than give in. The ladies hysterically prepare for battle. Lacking Ida’s idealistic courage, they all falter in the face of war. Alone, her ideals in tatters, Ida laments the loss of her dream. She accepts Hildebrand’s offer to settle their conflict with a duel between Ida’s brothers and the captive youths. At the last moment, Ida steps in and yields to Hilarion. Florian wins Melissa, Cyril wins Psyche, and Blanche wins control of the University.